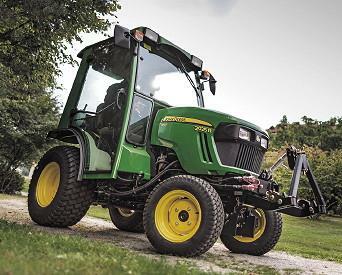 If the John Deere 5055E, 5045E, 5065E, 5075E tractor equipped with creeper, start the engine with the range lever in neutral position and gear lever in park position. - Push hand throttle forward off idle position (approximately 1/3 of full throttle). Engine may not start with throttle pulled completely down. - Start engine only from operator's seat with transmission in NEUTRAL. Dont run a cold engine at full throttle. Depress clutch pedal and turn key switch fully clockwise to engage starter. Release key when engine starts. If key is released before engine starts, wait until starter and engine stop turning before trying again. - Dont operate starter more than 20 seconds at a time. If engine does not start, wait at least two minutes for the starter motor to cool before trying again. If engine does not start in four attempts, refer to Troubleshooting. If charging system or oil pressure indicators fail to go out, or temperature gauge indicates hot, stop engine and determine the cause. Coolant Temperature Gauge - The needle on the temperature gauge rises as engine warms up. If needle reaches red zone, stop engine and determine the cause. Check coolant level in recovery tank and radiator when engine cools. Also check grille, radiator and radiator screen for plugging. Check fan belt tension. Oil Pressure Indicator - Oil pressure indicator will light if engine oil pressure is low. Indicator should light when key is turned to RUN position and go out when engine starts. Never operate engine without sufficient oil pressure. If indicator stays lit for longer than five seconds under normal operating conditions, stop engine and check for cause. Charging System Indicator - Charging system indicator will light when alternator output is low. Indicator should light when key is turned to RUN position, and go out when engine starts. If indicator stays lit for longer than five seconds in normal operation, stop engine and check for cause. Air Restriction Indicator - Air restriction indicator will light if air cleaner becomes plugged. Service air cleaner as soon as possible. Fuel Level Gauge - Stop to refuel before fuel gauge reaches empty mark. Use diesel fuel only. See Fuel, Lubricants and Coolant for fuel specifications. Should tractor run out of fuel and not start in several tries, air must be bled from fuel system. Tachometer shows engine rpm, read in hundreds. 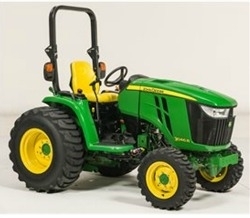 Warming Up Engine - Do not place JD tractor under full load until it is properly warmed up. Idle engine at 1200—1500 rpm for several minutes. Run engine at about 1900 rpm and under light load until engine reaches normal operation condition. Avoid Idling Engine - Allowing engine to idle at low rpm uses fuel inefficiently, and can cause a build-up of carbon in the engine. 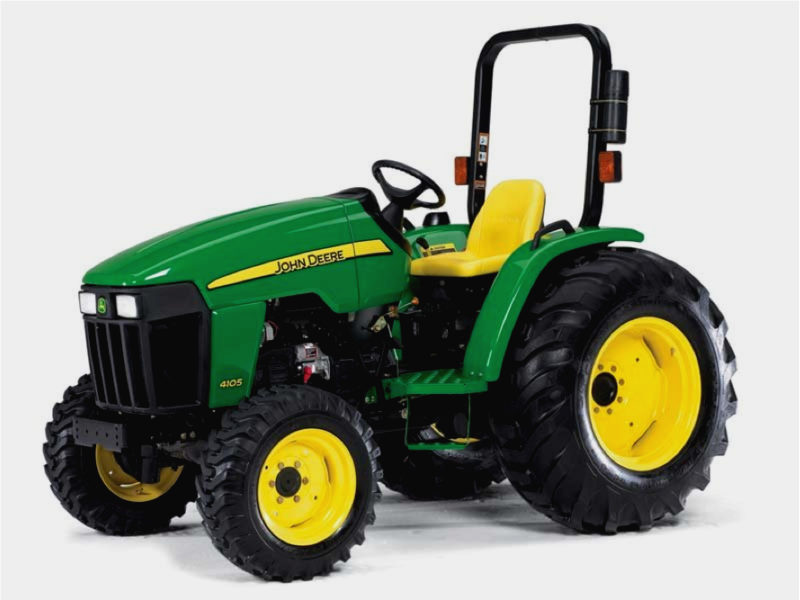 If John Deere 5065, 5055, 5045, 5075 tractor must be left with the engine running more than three or four minutes, minimum engine speed should be 1200 rpm. Observe Engine Work and Idle Speeds - Slow idle speed should be 800—875 rpm. At light or no load, full throttle speed will increase to 2575—2650 rpm. Normal working speed is 1600—2400 rpm rated speed. Within these limits engine can be put under full load. For correct PTO speed, run engine at 2400 rpm for standard 540 rpm operation. Restarting Stalled Engine - Should the engine stall when operating under load, depress clutch and restart it immediately to prevent abnormal heat build-up and continue with normal operation, or operate at slow idle for one or two minutes before stopping. - Move control lever inward and forward to engage PTO. Power Take Off indicator will light when PTO is engaged. - A warning alarm will sound for a few seconds if you leave seat with PTO engaged. - Turn key OFF to stop engine and make sure all mechanisms have stopped before cleaning out machine or making any adjustments to PTO driven implement. - Pull control lever back to disengage Power Take Off. - Move PTO lever (A) to rear (disengaged) position. - Remove spring lock screw (B). - Rotate PTO lever (E) counter clockwise until free play is removed (slight resistance encountered). - Adjust yoke (D) until spring lock screw can be installed through yoke and lever. - Install spring lock screw through yoke and lever. - If level is low, add oil through oil filler hole until even with upper mark. Dont over fill. Use seasonal viscosity grade oil. Periodically check coolant level in radiator. If cap should become defective, coolant would not be drawn from recovery tank, and could cause the engine to overheat. Replace cap as necessary. - Check level in coolant tank. - If engine is cool and level is below “LOW” add coolant to recovery tank to bring to “LOW”. - Run engine to heat oil. - The approximate engine crankcase oil capacity is 8.5 L (9 qt). - Remove oil drain plug and drain oil. - Replace engine oil filter while changing oil. Apply a film of oil on the new oil filter gasket and install new filter. Hand tighten plus 1/2 turn. - Add seasonal viscosity grade oil. - Engine Crankcase Oil Capacity - 8.5 L (9 qt). Engine oil should be changed annually as a minimum. A dual element air cleaner is standard. A dirty primary element is indicated when the air restriction indicator on instrument panel illuminates. A dirty element can result in loss of power or excessive smoke. Check unloader valve frequently. Empty as often as needed to keep it from filling with dust. If valve is allowed to fill with dust, air cleaner element will plug rapidly. Service air cleaner when indicator light illuminates, every 250 hours or at least once a year. Replace primary element at least one a year. The secondary element should be removed only when being replaced, normally once a year. - Replace if worn or damaged. Run 5045E, 5055E, 5065E, 5075E John Deere engine for five minutes to warm a cold belt. Let a hot belt cool for 15 minutes before adjustment. - Check tension by pressing belt midway between pulleys. Belt should deflect about 19 mm (3/4 in.) at 89 N (20 lb force). - Pry against alternator frame only. - Adjust tension by loosening cap screw and mounting bolt. Apply force to alternator frame until belt tension is correct. Tighten cap screw and bolt. Check Neutral Start System - JD tractor is equipped with interlocks to prevent inadvertent movement when the engine is started. Turning the key switch with the clutch pedal depressed should crank the engine if all of the following conditions exist: Gear shift lever in NEUTRAL, PTO lever in disengaged position. Replace FuelGard filter element at least once a year. - Remove retaining ring and filter. - Install new filter with retaining ring hand tight. - Open fuel shut-off and bleed air from filter. For efficient operation, drain old coolant, flush the entire system, and fill with clean antifreeze solution at least once every two years. - Drain coolant - Remove radiator cap. Open drain valve on radiator and drain coolant from radiator. Drain coolant from engine block. - Thermostat must be removed to ensure a thorough flush. Remove thermostat cover, remove thermostat, and install cover (without thermostat). Tighten cap screws to specification. Thermostat Cover Cap Screws Torque - 47 Nm (35 lb-ft). - Flush system with radiator cleaner - Close all drain valve/plugs, reinstall cold start aid switch and fill the cooling system with a good commercial radiator cleaner and water. Follow instructions provided with cleaner. Stop engine and immediately drain system. - Flush system with water - Close all drain valves/plugs, reinstall cold start aid switch and fill with clean water to flush the system. Run the engine about 10 minutes, then drain out flushing water. - Remove thermostat cover and clean off the gasket material. Apply gasket sealant to new gasket and install thermostat and cover. Tighten cap screws to specification. - Fill with fresh coolant - Close all drain valves/plugs and fill with a mixture of antifreeze, soft water, and coolant conditioner as specified in the Fuels, Lubricants, and Coolant section. - Check coolant level - Fill radiator to the top of the filler neck and fill the recovery tank to the “LOW” mark. Run the engine until operating temperature is reached. Let the engine cool (preferably overnight) and recheck the coolant level. Coolant level with a cold engine should be at the “LOW” mark. An engine at operating temperature should have a coolant level at the “FULL” mark. When filling the cooling system it may require several operating/cooling periods to stabilize the coolant level in the system. Add make-up coolant to the recovery tank as needed to bring the coolant level to the correct mark. - Loosen cap screw and bolt and rotate the alternator to free the belt. - Remove belt from drive pulley. - Belt can be pulled around fan to remove. - Install new belt in reverse order of removal. - Fuel tank must be full of fuel. To avoid injection pump damage Dont attempt to start the engine while bleeding the fuel system. - Loosen fuel return line. Loosen filter base bleed screw. Push primping pump until fuel runs out smoothly without spiting, then tighten bleed screw. - Loosen injection pump bleed screw. Push priming pump until fuel runs out smoothly without spitting, then tighten fuel return line and bleed screw. Range shift lever provides three forward speed ranges. Speed shift lever provides three forward speeds and one reverse speed. Using range and speed shift levers in different combinations, nine forward speeds and three reverse speeds can be obtained. Range shift must be in neutral for the engine to be started. To prevent unnecessary clutch wear, never rest a foot on clutch pedal while operating tractor. The clutch pedal must be fully depressed in order to make a speed shift. If the clutch pedal is not fully depressed, the shift lever can not be moved beyond neutral in the H-pattern. Should this occur, depress the clutch pedal further. If the clutch pedal free travel is out of specification, readjust the clutch pedal linkage. The TSS transmission allows any forward gear or reverse to be shifted while in motion. However, the clutch must be disengaged and then engaged by means of clutch pedal. Make sure to depress clutch pedal fully and release it gradually to take up load smoothly. 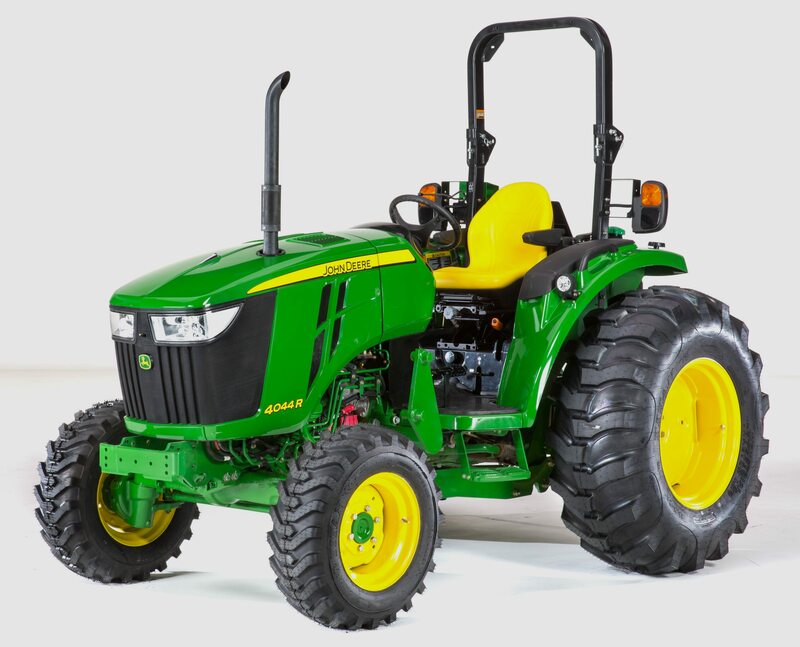 For JD 5075E, 5055E, 5065E, 5045E tractors with two wheel drive the transmission allows only second gear and reverse to be shifted while in motion. Top shaft synchronizer works only on speed gears, including reverse. To shift into a different range, tractor must first be brought to a complete stop, and the engine speed brought down. After the tractor is stopped, the clutch must be depressed fully to make the range shift. Depressing the clutch fully and reducing engine speed while shifting ranges will prevent damage to the transmission. Once the shift has been made, then increase engine speed. 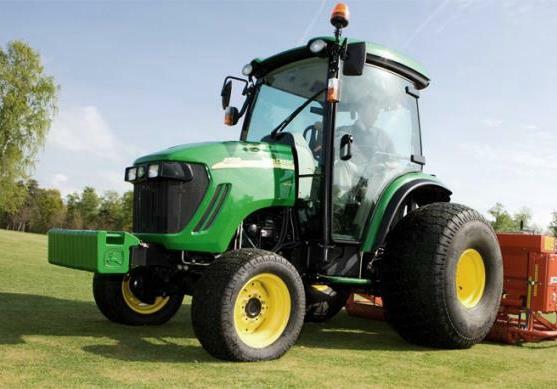 Select a Gear - To extend drive train life and avoid excessive soil compaction and rolling resistance when using ballast, operate one gear lower than normal. The tractor may be operated in any gear with engine speeds between 1800 rpm and 2400 rated engine rpm. Within these limits the engine can be put under full load. For light load operation, use a higher gear and lower engine speed. This saves fuel and reduces wear. Ground Speed Estimates for different tire sizes are located in Specifications. Use Brakes - Before operating tractor on a road, lock pedals together. Use brake lightly and cautiously at transport speeds. Use individual brakes to assist in making sharp turns. Disengage brake pedal locking bar and depress only one brake pedal. To stop tractor, depress both brake pedals. To prevent unnecessary wear, never ride the brakes by resting a foot on the pedals. Reduce speed if towed load is not equipped with brakes and weighs more than the tractor. Avoid hard braking applications. Use additional caution when transporting towed loads under adverse conditions, when turning or stopping on inclines. Use Differential Lock - Dont operate John Deere 5065, 5045, 5055, 5075 tractor at high speed or attempt to turn with differential lock engaged. To prevent damage to drivetrain. Dont engage differential lock when one wheel is spinning and the other is completely stopped by the respective brake. When one wheel starts to lose traction, engage differential lock by depressing pedal down. Keep the pedal pressed till the traction at both the tires equalizes and tractor comes out of the ditch. If lock does not disengage, depress one brake pedal and then the other. If tires repeatedly slip, then get to traction, then slip again, hold pedal in the engaged position. - Remove dipstick and wipe it clean. Insert dipstick fully. Oil level should be between full mark and end of dipstick. - Add oil if level is low. - Measure free play at top of pedal stroke. Adjust linkage to obtain 20 mm to 25 mm free play. - To adjust linkage, loosen lock nut, unlatch the connecting clip pin and remove. Rotate clevis. - After making adjustment, replace clip, and recheck free play. When free play is correct, tighten lock nut. - The approximate transmission case oil capacity is 38 L (10 gal) for 2-WD tractors and 39 L (10.30 gal) for MFWD tractors. - Remove drain plug from transmission case and drain out oil. Dispose of waste oil properly. - If equipped with MFWD DANA axle, also remove drain plug in drop housing. - Replace filter while changing oil. Apply a film of oil to new filter gasket and install new filter. Hand tighten only. - Fill system with transmission-hydraulic oil. Transmission Oil Capacity (2-WD/MFWD) - 38L/39L. - Check oil level at dipstick after filling, and again after operating for five minutes. - Drain transmission-hydraulic oil. The approximate transmission case oil capacity is 38 L (10 gal) for 2-WD tractors and 39 L (10.30 gal) for MFWD tractors. - Remove two cap screws and remove screen cover. - Remove screen and examine it for damage. Replace if necessary. Clean screen in solvent and blow dry with compressed air. - Fill system with transmission-hydraulic oil. Use mechanical front wheel drive (MFWD) as required for better traction. Mechanical front wheel drive greatly increase traction. When this option is used, extra caution is needed on slopes. Compared to 2-Wheel drive, a mechanical front wheel drive tractor maintains traction on steeper slopes, increase the possibility of a tip over. When driving on icy, wet or graveled surfaces, reduce speed and be sure tractor is properly ballasted to avoid skidding and loss of steering controls, engage mechanical front wheel drive. To extend tire life engage mechanical front heel drive when needed. Dont engage when driving on hard surfaces. Dont install tire chains on tractor front wheels, chains will strike and damage tractor. To prevent transmission damge. Dont engage or disengage mechanical front wheel drive on the go. Depress clutch pedal and stop tractor before engaging or disengaging MFWD. Push shift lever forward to engage, and pull lever back to disengage MFWD. - Jack up front end of tractor. Dont place jack under engine oil pan. - Remove four nuts and tapered bolts from front axle (2 on each side). - Reinstall axle nuts and bolts on each side. Tighten bolts to specification. - Park JD 5045, 5055, 5065, 5075 tractor so that oil fill mark on MFWD hub is level with the ground. Remove filler plug. Oil level should be even with bottom of the filler plug hole. - Remove plug to check oil level in axle housing. Oil level should be even with bottom of hole. - If level is low, add HY-GARD Gear Lubricant or its equivalent. Lubricate Front Axle Pivot Pin - Lubricate DANA MFWD Axle front pivot and rear pivot with several shots of multipurpose grease. Adjustable 2WD axle pivot pin also requires lubrication of the front and rear pivot bushing jerks with multipurpose grease. - Tractor should be positioned on level ground to assure correct oil levels when filling. - Each front wheel hub has a drain/fill plug. - Remove drain/fill plugs. When draining the wheel hubs, rotate the wheels so the drain/fill holeis in the 6 o'clock position. Drain oil. - Rotate the wheels so oil level mark is parallel to the ground. - Fill differential housing at fill locations with HY-GARD Gear Lubricant. Fill hubs to level mark, and differential housing to bottom of fill hole. - Loosen front wheel cap screw. - Raise front end of tractor. Support 5045E, 5055E, 5065E, 5075E John Deere tractor securely on stands before removing a wheel. - Remove wheel. Remove cover (10), cotter pin (9) and retaining nut (11) to remove wheel hub (6). - Bearings (7 and 12) are press fitted into hub (6), and will come out along with hub. - Lubricate hub (6) with several shots of multipurpose grease though zerk at spindle plug (13). Remove spindle plug (13) and install grease zerk if required. - Install hub assembly (6) and retaining nut (11). Tighten nut until a slight drag is felt while turning hub. - Back off nut just enough to install cotter pin (9) in hole of spindle. - Apply flexible sealant to mating surface of cover and hub. Install cover. - Install hub cap and wheels. Tighten lug bolts to specification. Tighten bolts again after driving tractor 100 m (109 yd) and again after three hours and 10 hours use. Lubricate Rear Axle Bearings - Lubricate rear axle fittings, both sides, with several shots of multi-purpose grease. - Park machine on level surface. - Turn steering wheel so front wheels are in the straight-ahead position. Stop engine. - Determine the difference between front and rear measurements. If the front measurement is smaller, toe is “in”. If the rear is smaller, toe is “out”. - Distance at front of tires should be 3—6 mm (1/8—1/4 in.) less than distance measured at rear of tires. Adjust toe-in if necessary. Wheel tread on MFWD axle with multi-position wheels can be adjusted by repositioning or exchanging the rims or by reversing the wheel disks. 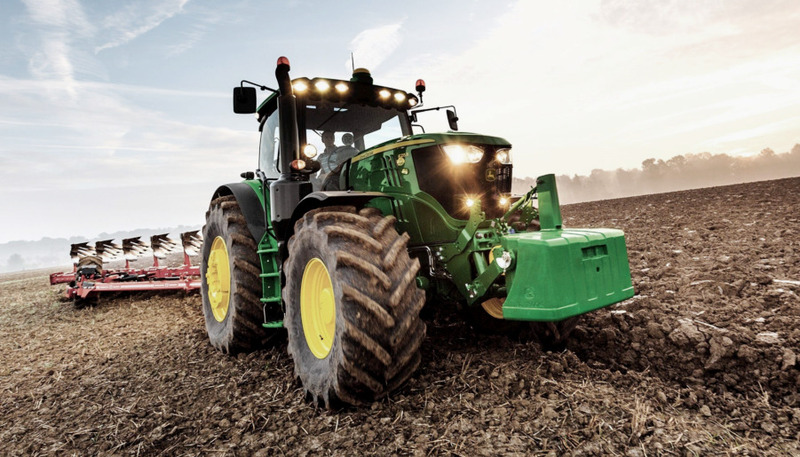 Wheel tread can also be adjusted by exchanging the complete wheel to the opposite side of the tractor . (This maneuver permits the change from disk-dished-in to disk-dished out operations without disassembling the wheel). When Changing MFWD wheels from one side to other, the arrow on side wall of tire points in the direction of forward rotation. In certain applications, MFWD equipped tractors may operate with the arrows in the opposite direction. See Select Front Tire Rolling Direction. The relationship of the wheel disk and rim in obtaining the different tread setting is shown in the diagrams, before attempting to change tread settings, will save unnecessary labour. After setting wheel spacing, tighten MFWD wheel rim-to-disk bolts and MFWD wheel disk-to-hub nuts to specification. Drive tractor 100 m (109 yd) and tighten again. Transmission oil overheats Low oil supply. Fill system with correct oil. Clogged transmission-hydraulic oil filter. Replace filter. Hitch feedback linkage improperly adjusted. Reset linkage. Hydraulic motor not plumbed correctly. Low transmission pressure. Low oil supply. Fill system with correct oil.